Another stand-by recipe from our house is Evil Deli Chicken. Don't you just love that name? :-) It's 'evil' because it's so good, it must be bad...get it? I got this recipe from my friend, Betsy, who's a kindred spirit of mine. She found the recipe here. Betsy, thanks so much for sharing it with me! This is a crockpot recipe, so follow these few steps in the morning, and look forward to a sinfully delicious dinner tonight! Buy the biggest fryer you can find that will fit into your crockpot. (We have also done the cut-up whole chicken route, and it works fine, too.) Spray the inside of the crockpot with cooking spray. Scrunch up a big piece of aluminum foil and put it in the bottom of the crockpot. This will act as a "rack". 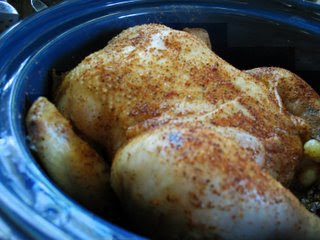 This chicken will be pretty juicy, and the foil will keep the chicken from stewing in its own juice. Pull out all the giblets, etc., from the inside of the chicken. Wash, pat dry and rub all over with olive oil. Sprinkle inside and out with Lawry's Seasoned Salt (a good Cajun seasoning could be used, as well). Place the chicken in the pot on top of the foil. Cook on low for approximately 8 hours. Chicken will resemble a whole rotisserie chicken like the ones you buy at the deli counter. Lift it out of the pot and carve as you wish. It will be cooked to perfection and will be tender and moist. Enjoy! Tune in next week for Rubber Chicken... are you intrigued?